I am honoured to have been invited to take part in Suffolk Libraries Bookfest 2016. I shall be speaking at Great Cornard Library on Saturday 22 October, starting at 3.30pm. Tickets are £6. Previous Book launch buzz! Next Five star review! Good evening Rosy. I am currently really enjoying the local backdrops to your writing, being a Woodbridge resident. 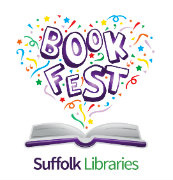 Are there any plans for a talk in Woodbridge or Blaxhall as part of the Suffolk Libraries book Fest? Thanks for getting in touch, Neil! I launched the book in Woodbridge Library back in July and last month spoke in Browsers Bookshop, so I’m afraid there are no more Woodbridge gigs on the horizon. For Suffolk Libraries Wordfest, I am booked to speak over at Great Cornard – rather a schlepp from Woodbridge, I fear.